The Shopify Expert directory is made up of a community of set up experts, designers, developers, marketers and photographers who can help you get started with your Shopify store. Achieving expert status shows 30acres is now part of an elite list of partners with proven Shopify expertise. 30acres can provide quality advice you can trust, with the competency to complete projects to your satisfaction on the Shopify e-commerce platform. 30acres is listed as a design, development, marketing and Shopify set up expert. With our proven track record, we have achieved a quality of Shopify e-commerce solutions and custom applications that have passed the Shopify test, highlighting our commitment to providing premium quality services. 30acres is very experienced in setting up Shopify stores for brand new businesses from the ground up. We have been helping businesses to successfully launch themselves online with brand new Shopify solutions showing great results. Though, arguably we’re even better at seamlessly migrating online stores to Shopify from other platforms. We have helped several clients by building in-house apps to achieve this seamless migration especially when it comes to moving inventory from one management system to another and generating custom redirect importer/managers. Several of our fashion clients use Niche or other similar inventory management systems. The problem we encountered was the lack of integration with their online stores. Accordingly, we took this onboard and created our own custom solution. We merged their Niche inventory management system with their customised Shopify website ensuring set up and migration was a smooth, efficient and effective process for all. 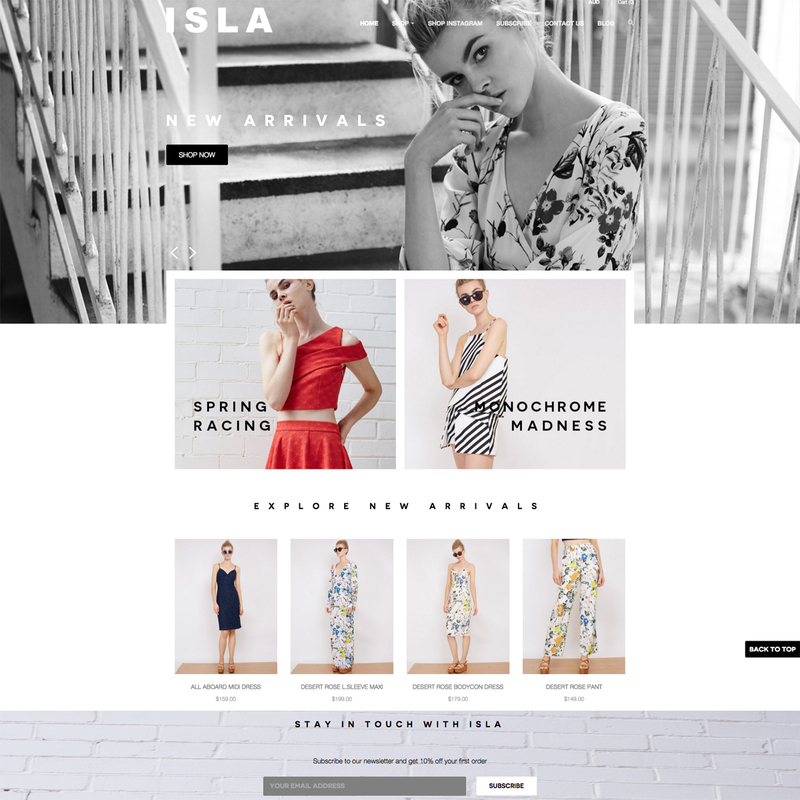 Read more about this case study for Isla the Label here. Along the same lines, our web developers turn big ideas into fully functioning shops with theme modifications and the development of such custom apps. A number of our clients take advantage of our completely custom built themes tailored to aesthetic and functional qualities that our clients request. Some such requests involve the functionality required to manage wholesaler/retailer management and interactive global store locators. See this in action by visiting Eye of Horus Cosmetic’s custom developed store locator. Our development work is in no way limited to these examples. We’ve built custom Google Feed Manager apps for PLAs to assist SEM efforts as well as a custom Ruby Gem for a modern approach to Shopify API integration. If you have a specific need, we’ll make it happen. We are currently looking into making some of our private apps available in the Shopify App store. For custom app development and integration for your Shopify needs in the meantime, get in touch! 30acres has in-house designers that work closely with our developers to not only achieve the desired functionality, but ensure its aesthetics are always on brand and optimised for conversions. 30acres works closely with third party plugins to make a subscription (recurring payment) solution a reality for our client, The Candle Library. The solution involved initial backend integration followed by front end customisation into their Shopify theme. 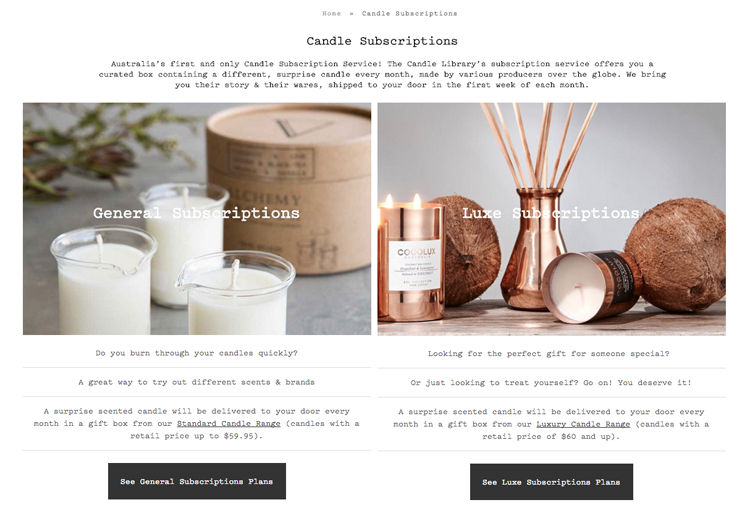 Of particular note, we developed a custom matrix to funnel and condense the design of twelve subscription plans into an easily navigable path to conversion for prospective customers. Read more about this custom design matrix here. A Shopify design customisation we’ve recently worked on was with another client, Children of the Tribe. Their request was based around managing their successful style of content marketing. The whole look and feel of their website is frequently switched up with new and distinct campaign images, so this client needed to be able to switch their homepage aesthetic from one to the next without any overlap. We created a custom Shopify Homepage builder within their Shopify platform to preupload content and switch in one seamless click without any intermediate stages. If this sound like something you’d be interested in, read more about it and get in touch here! 30acres is a unique digital marketing agency with expertise in digital marketing strategy and execution. Our team members are highly skilled practitioners in Search Engine Optimisation, Search Engine Marketing, Email Direct Marketing, Social Media and website development. As part of our team, we have SEO, SEM and EDM specialists, content marketers, social media strategists, graphic designers and developers. With this mix of expertise under one roof, we’re in the perfect position to provide a holistic service to any online business, particularly e-commerce stores. We’ve been responsible for delivering results and profits for many successful domestic and global entities. We deliver on singular campaign projects, as well as ongoing longterm marketing strategy for any or all of the services we provide. If you’re interested in finding out more about our custom design, development or marketing services, or you’d like to talk to us about helping with your e-commerce site set up, we’d love to hear from you! Visit our Shopify Experts profile here!